The beautiful views, pristine white sand beaches, swaying palm trees and sweet sunsets have long been luring couples to spend some romantic time together in Koh Samui. In recent years, it has become increasingly popular as the destination of choice for a tropical overseas wedding. As brides to be and their grooms seek out a private location in which to get wed, our luxury Koh Samui villas have become increasingly popular as a wedding venue choice. Here at Thailand Retreats we have a number of villas in our wedding venue collection that enable you to gather all of your friends and family together to come and celebrate your big day in luxurious and exotic surroundings. 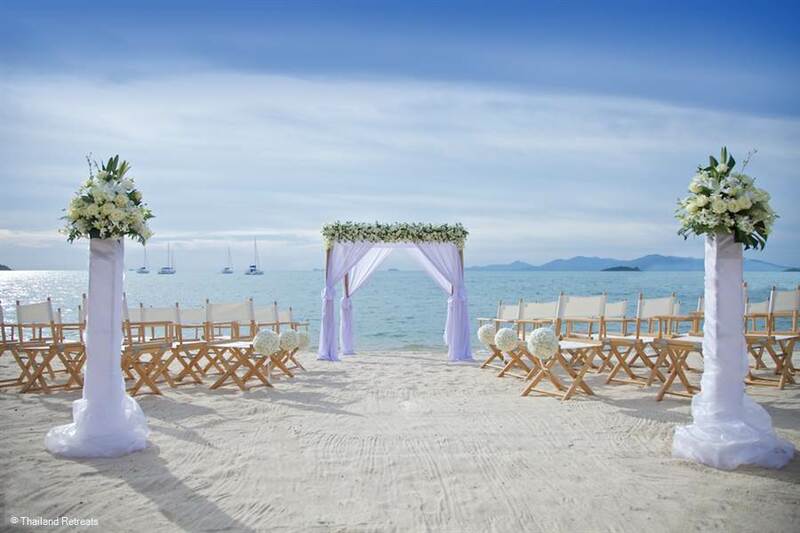 Once you’ve decided on Koh Samui as a wedding destination, the next step we recommend is to pick a venue. The great thing about picking a villa for your special day is the level of privacy you are offered during the ceremony and reception. At larger resorts you’ll often be sharing the venue with other holiday guests. This can impact on feelings of privacy and your wedding photo’s. In a villa, you minimise your chances of an unknown crowd watching your ceremony. It’s worth mentioning, that there isn’t a private beach on Koh Samui. This is part of the law. Some of our villas are tucked away in a cove with very little through traffic, so you could almost consider them to be private. Of course the properties themselves are private and if you are in a hillside villa, it is very likely to be a private bolthole. The other good point about staying in a villa for your wedding is that yourself and your closest family and friends can enjoy from 3 days or a week or two enjoying the company of each other, without having to rush around ensuring you can chat to everyone on the big day. Whatever you choose to do, you’ll likely experience the beautiful pool, sunsets and delicious food on offers in our villas. When you are planning any wedding, it’s a good idea to set a budget. You’ll need to look at the cost of the villa hire and if you will split this between guests staying at the villa for their whole entire stay or if you will fund this as part of your wedding budget. In addition to this, think about the flights and get these booked. It’s a good idea to let potential guests know at least one year in advance so that they can organise their travel. Think about sending out save the date cards or even ‘save your holiday’ cards. As well as the actual flights and venue, there is the big day itself to think about. Of course there are costs like outfits for the bride and groom and rings to think about. The rest of the celebrations are very flexible in Thailand. There are such a wealth of choices of things that can be arranged. See more about this in ‘The Big Day’ section below. As a rule the rainy season is mid October through December in Koh Samui however this is not always the case and weddings take place throughout the whole year wih January to April being the most popular time though the villas tend to be slightly more expensive. It’s fairly easy to get any kind of religious or non religious wedding ceremony performed in Thailand. The Legal Requirements though are quite specific and you will need to travel to Bangkok on arrival and allow three days for the paperwork to be completed. Depending on your nationality the rules may differ, but British people must complete a certificate at the British Embassy in Bangkok.This then needs to be translated into Thai and there will be a fee to pay for this. The thing about getting married in Thailand is that so much can be organised to help you create your perfect day. You can request Thai lanterns, tikki torches, fireworks, a rose petal aisle, entertainers like a fire dancer or traditional Thai dancers. At many of our villas we can arrange for hairdressers and beauticians to visit the villa beforehand to help the bride get ready. The flowers available in Thailand are simply stunning - hibiscus, frangipani, bouganvilliea, Birds of Paradise. It is easy to select beautiful flowers to co-ordinate with your colour scheme of choice. Most of our villas have event planners and in-house chefs provide a choice of menus to offer from canapes, BBQ, sit down meal to a buffet. We highly recommend the services of a wedding planner to arrange for a wedding at the villa location. Contact us and we will recommend the approved wedding planners that work with the particular Koh Samui villas chosen. Childcare can be arranged at several of our villas too. See all of our wedding venue villas.